There are loads of detox diet recipes out there, but in my opinion the best one is a diet that continually detoxifies your body so you never have to be in crisis again. There are teas, potions, elixirs and unpleasant concoctions that all claim to do the job, but as Hippocrates stated nearly 2000 years ago, “let thy food be thy medicine.” The best detox diets are comprised of healthy life giving foods that by their nature cleanse and detoxify the body as a natural part of their metabolism. Raw foods contain these life giving qualities and will sustain a healthy body far into the twilight years and beyond. While whole raw food meals are detoxifiers by nature, recipes with more fat will tend to slow down the detoxification process, although some fat is also required to release some toxins stored deep in fat deposits of the body. So in general eating a raw foods diet will cleanse, detoxify and promote weight loss if needed, but green smoothies and juices are real detoxifiers. When looking at really powerful detox diet recipes, juices would be at the top of the list with green smoothies a close second. 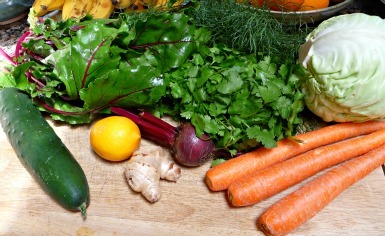 The juices having minimal fiber are very easy on the digestive system and go right to work within minutes of drinking. Depending on your level of toxicity you may experience significant detox symptoms which are flu like in nature and can make you unable to function in your normal routine. Green smoothies are easy on the digestive system as well, because they are liquefied, but will be easier on your system because they contain fiber and perhaps a little added fat of some sort. The beauty of green smoothies is that they are detoxifiers, yet they will allow you to function at your normal pace, unless you are quite toxic. A person can always alternate juices and smoothies providing you the best of both worlds. Plenty of pure water should be available as needed and would be better first thing in the morning and in the evenings than either juice or a smoothie. Green juices and green smoothies are very powerful because of the minerals and the chlorophyll they contain. Chlorophyll, the natural occurring molecule that gives green plants their color, is a powerful detoxifier. Chlorophyll stimulates the bowels and cleanses the intestines; it’s an oxygen booster, blood purifier and builder and improves liver function which is key to any detox diet. Chlorophyll alkalizes the body, cleanses the kidneys, is an anti-inflammatory, feeds good intestinal flora, boosts the immune system, and probably does a host of other good things that science is not even aware of yet. Cabbage - purifies blood and removes toxins like uric acid which is major cause for rheumatism, gout, arthritis, kidney issues, skin diseases, and eczema. Because of its high vitamin C content it’s a great free radical scavenger. The strong detoxifying effect of cabbage is due to its high sulphur content. Fennel - relaxes the gut, which can relieve spasms of the gastro intestinal tract, bloating, gas and abdominal pain, which can sometimes accompany detoxification. Celery - is an excellent cleanser, a natural laxative, and an alkalizer. It has cleansing properties that aid digestion, cleanse the liver and gall bladder, and it’s a diuretic. Dandelion greens – a very powerful liver detoxifier and mild diuretic. Dandelion greens are high in vitamin A, which helps regulate the immune system by producing white blood cells that destroy bacteria that cause infection and illnesses. Burdock root - is one of the world's best blood purifiers and general system tonics, it supports healthy liver function and detoxifies the kidneys and the gall bladder. It reduces inflammation, swelling and calcification deposits in the body, and is a heavy metal detoxifier. Jujubes (aka) Chinese dates – cleanse the liver and the spleen, aid digestion, calm the nerves, very high in vitamins and minerals. Carrots – are also high in vitamin A and are good cleansers. They are also sweet, which can help in consuming detox diet recipes. There are many more foods that assist the body in cleansing and self healing, in fact most fresh raw foods help the body to cleanse, heal, and detoxify, but this is a powerful list that will provide ingredients for many healthy detox diet recipes. Combining just a few from this list with other fresh raw fruits and vegetables in your daily diet will go a long way in promoting a healthy body. Now let’s check out some healthy detox diet recipes. There are many more healthy cleansing recipes available on the raw recipes page.